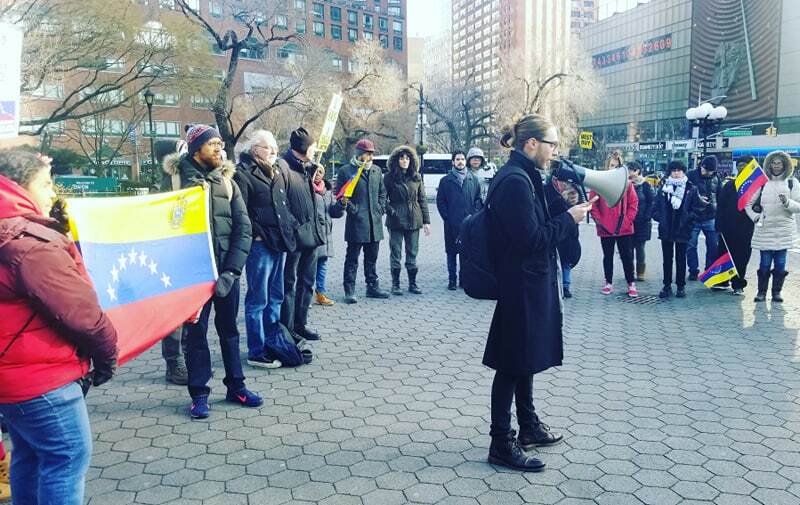 New York protests U.S. coup attempt in Venezuela | Fight Back! The first was held outside of the Cuban Mission with over 50 people in attendance. The action was hosted by various groups, including International Action Center, and featured speakers from national liberation movements and anti-imperialist organizations. All organizations stated their solidarity with Venezuela and opposed the coup. 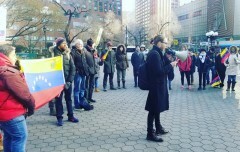 “Before you blame Maduro or Chávez for starvation and other problems in Venezuela, look first at the U.S., which has collaborated with the wealthy class in Venezuela to create scarcity of goods, hoarding food and other necessities from the people to create a crisis and then threaten coups and intervention,” said Jessica Schwartz from Freedom Road Socialist Organization. The second action took place at Union Square and was hosted by G-REBLS. Speakers connected current events in Venezuela to the U.S.’s history of intervention. Collin Poirot from Committee to Stop FBI Repression NYC spoke about how the U.S. government’s actions abroad are connected to its actions at home. “When the U.S. is waging war in other countries, whether overtly through puppet forces, or through covert operations, that violence is carried out in the U.S. as well, in the form of government repression, and attacks on organizers and oppressed nationality communities,” Poirot stated. All of the organizations vowed to continue fighting in defense of Venezuela and against U.S. intervention.